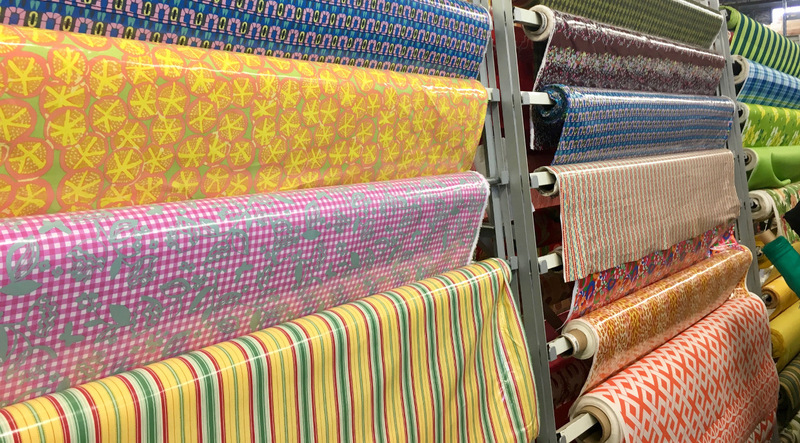 We are back with another contribution to our fabric shopping series from cities around the world. 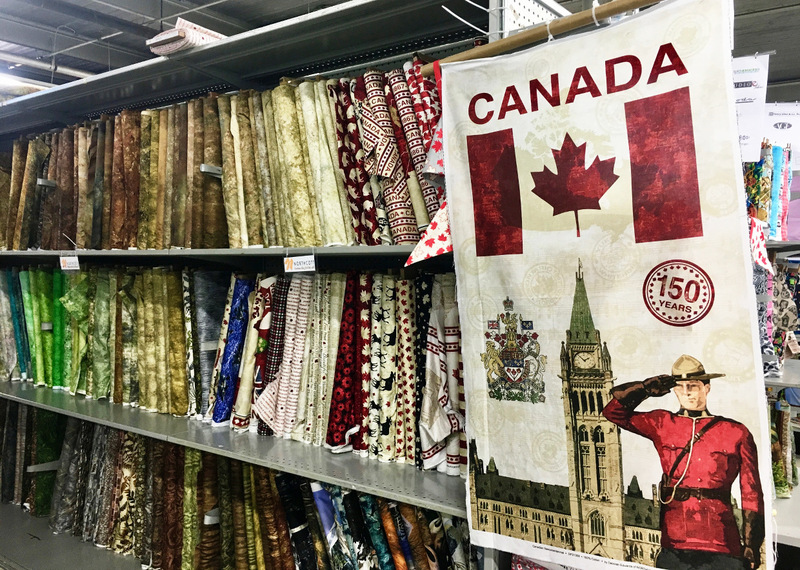 Today Jessica is giving us a fabric shopping tour of the Toronto, Canada. Glad to have you here Jessica! 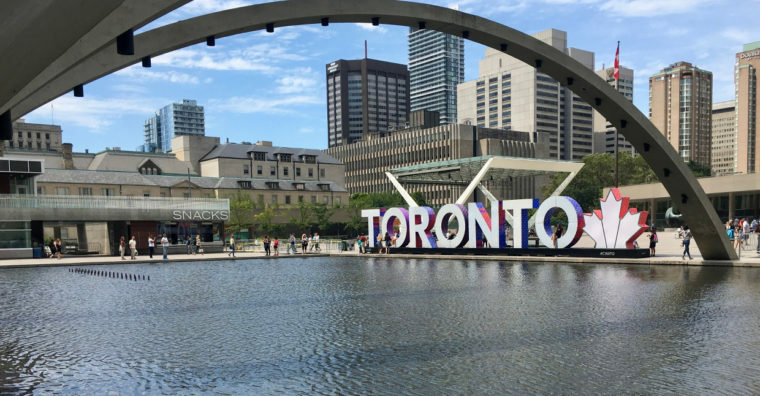 Toronto is a diverse city with a population of 2.7 million people. If you count everyone in the Greater Toronto Area, you get closer to 6 million. Although it is a big city, it’s a city of neighborhoods, allowing you to experience a different vibe, depending on where you are. I live in the West End of Toronto, near High Park. It’s leafy and green, with plenty of great places to walk and have a coffee. 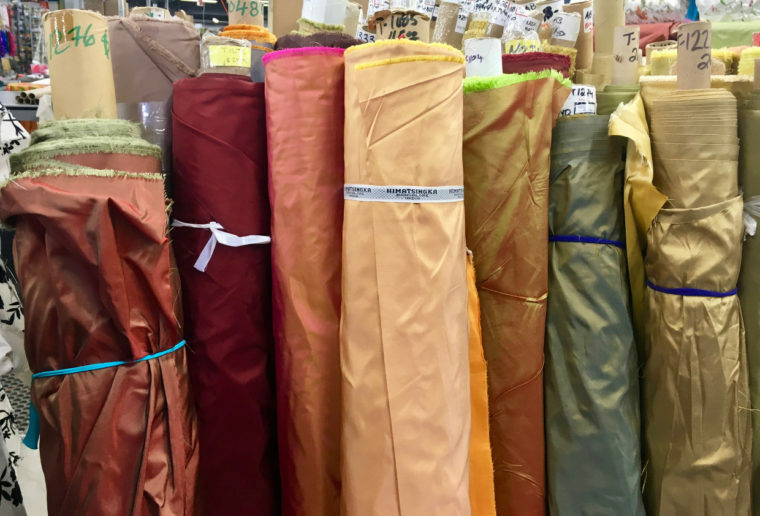 My favorite fabric shops are in the Western part of the city, but I tried to get around to a few different places to give visitors a good selection to check out on their travels! 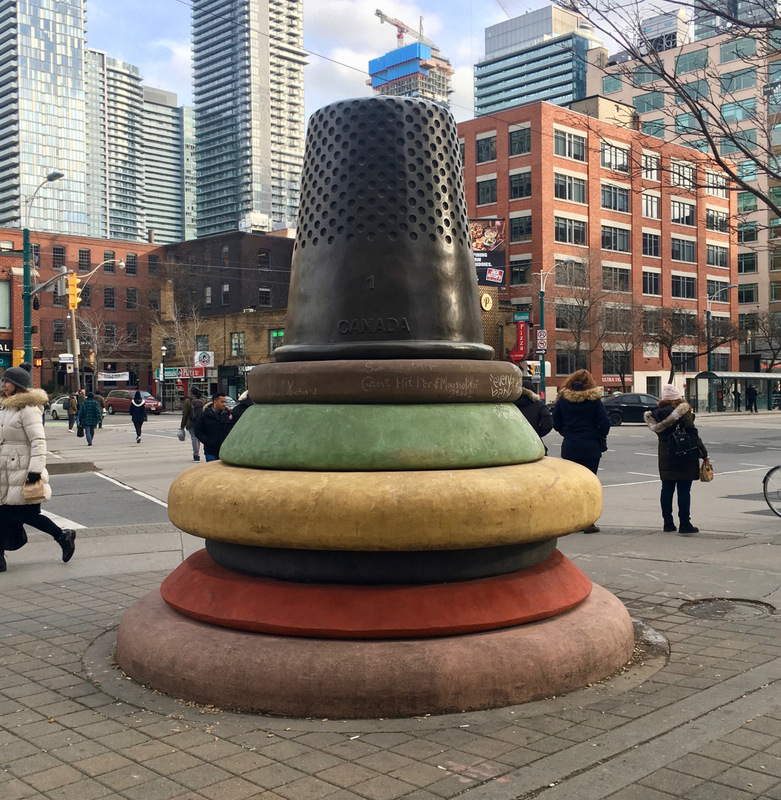 Toronto boasted a robust garment industry in the early 1900’s, with large factories and warehouses, including some beautiful art deco buildings scattered throughout the 35 block downtown area. 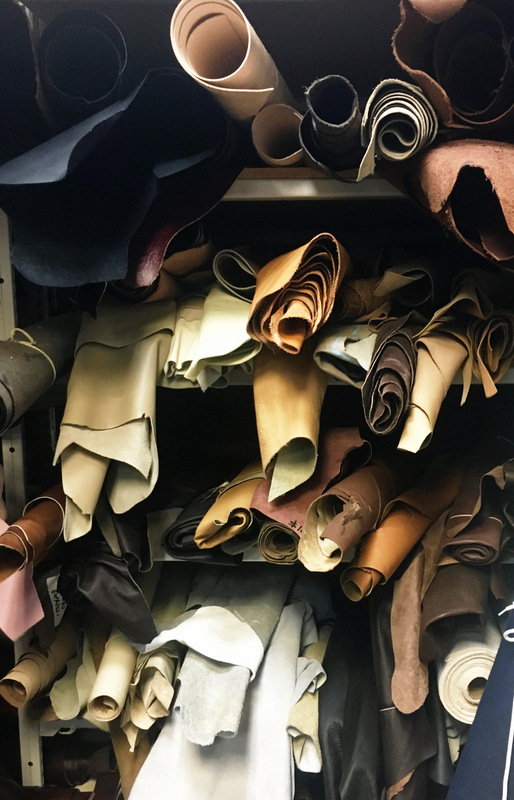 There are still some nods to the fashion district in the King and Spadina area, including bridal shops, furriers, leather suppliers, and textile stores. First up is my go-to fabric and crafty heaven, The Workroom. Karyn Valino opened her doors almost 11 years ago and her clients are so happy that she did! Nestled in the funky, urban Parkdale neighborhood just West of downtown, The Workroom is a place to find all things modern and lovely. This shop is a true multi-use crafting haven, with a revolving roster of classes, by-the-hour sewing and long arm quilting, monthly Stitch and B*tch sessions, and Sewing Dates where you can come with your bestie and work together on your projects. Class offerings consist of everything from quilt making and floor loom weaving, embroidery, visible mending and sewing your own pair of bespoke jeans. From your basic Kona cotton solids to Nani Iro to Essex Linens, you’ll find everything for your next project here. They stock a good selection of soft, beautiful knits and regularly stock Japanese denim and silky Liberty lawns. 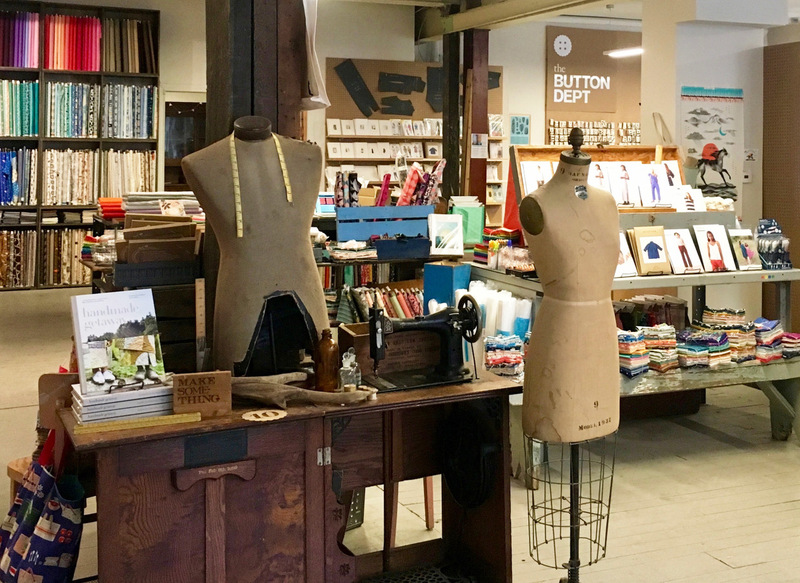 Plenty of notions, including Clover, Mettler threads, Soak fabric wash, and patterns by Liesl + Co., Merchant and Mills, Victory, and others are in good supply. You’ll always find great quilt patterns too by the likes of Elizabeth Hartmann, Johanna Masko, Carolyn Friedlander, Lizzy House, and more. This is where I purchased my first Oliver + S patterns! Karyn has her finger on the pulse of the modern crafting and sewing world; this is reflected in the ever changing products that she brings in to support her clients in making up the latest bags, clothes, and accessories. It’s almost like she knows what we will want to make before we do! Of course you can also shop online here, but if you are in the mood to go for a walk and get some lunch or dinner along the Queen West of Dufferin strip, you can’t go wrong with a visit to The Workroom. 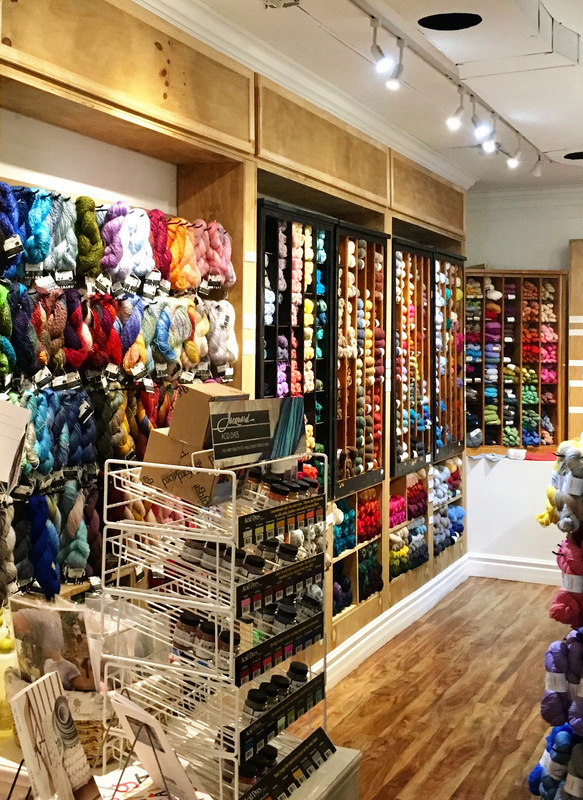 My next favourite spot is Eweknit, a sweet little fabric and fiber shop located in the Christie Pits neighborhood, just West of Yonge and Bloor. 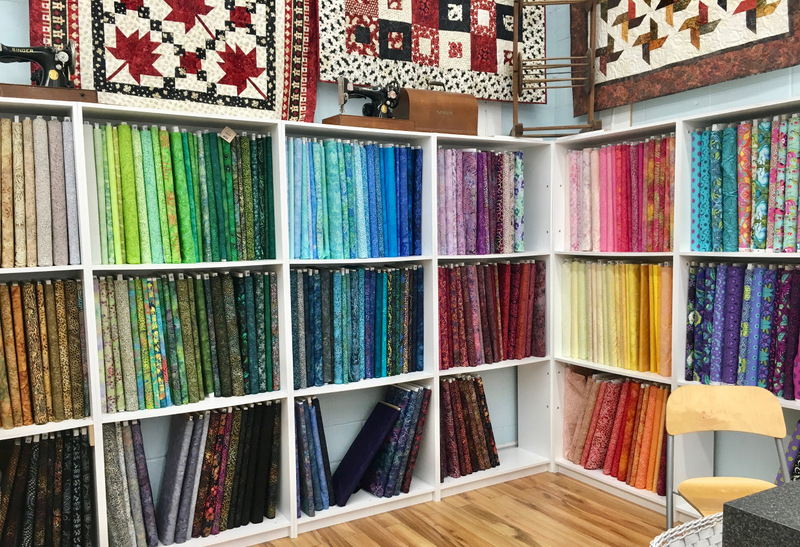 This little boutique boasts some lovely quilting cottons, both in yardage and fat quarters, as well as several walls of beautiful looking yarns. But if you only needed one reason to seek out this shop it is certainly for their selection of Liberty tana lawns. 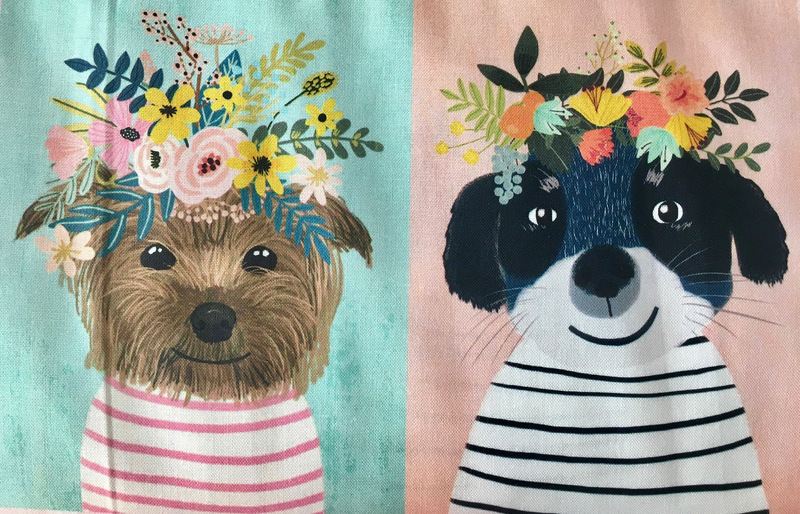 They are stocked in both classic and seasonal selections, yardage and pre-cuts, and I have never wandered in without finding another gorgeous print to bring home. They have pre-cut Liberty kits for making baby quilts and blankets in coordinating colors. What a way to wrap a baby in softness! 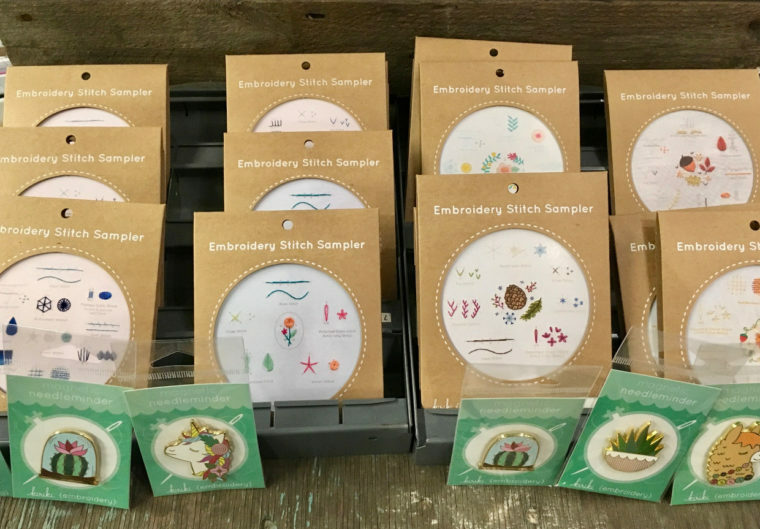 In addition, Eweknit stocks some lovely crafting wool sheets and roving, including kits to make your own sweet wool creatures at home. As I mentioned above, they do have a nice looking selection of yarns/wools, so if you are a knitter, you would not be disappointed. They also offer classes here, if you have time to learn some hand work. Before I go too far off the beaten path, I should mention The Leather and Sewing Supply Depot. Located conveniently at Queen and Spadina, this is where I go for all my leather and hardware needs. Leather straps for a tote, or trim for a wallet? You’ll find it here. Need zippers? No problem. Snaps and rivets? Got it. This shop is a treasure trove for bag and pouch makers. Well worth a stop in! In the same breath, I would be remiss if I didn’t mention Mokuba, just down the street. If you are needing something very special, or just want to go ogle some gorgeous trims, your time will be well spent here. My next location is still West Toronto, near Yorkdale. Len’s Mill. This is certainly more of a warehouse style shopping experience, but I wanted to check it out for those who would like an all-in-one store. This location in particular may be worth a trip if only because they acquired the stock from the recently closed Designer Fabrics, a cornerstone of the fabric supply scene in this city. Here you will find every kind of novelty quilting fabric you can imagine, alongside many flannels and fleeces. 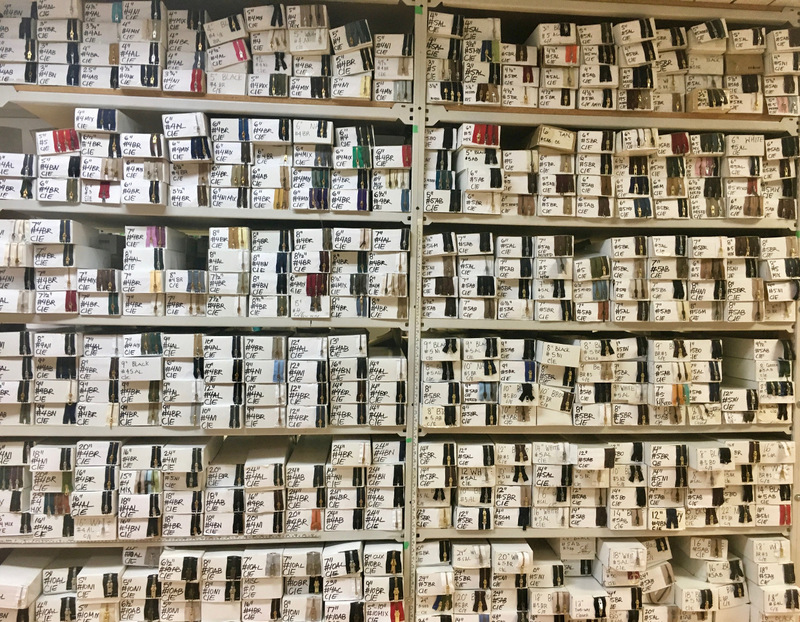 But if you wander to the back of the warehouse, you’ll find the remaining shirting, silks and linens, garment, and home dec textiles that Designer Fabrics was famous for. I did also surprise myself by finding some laminated fabrics and funky sequins that would have been tempting if I had a project in mind. Not far from here and accessible by public transit is Sew Sisters quilt shop. This brick and mortar quilt shop carries everything to make your quilting heart sing. 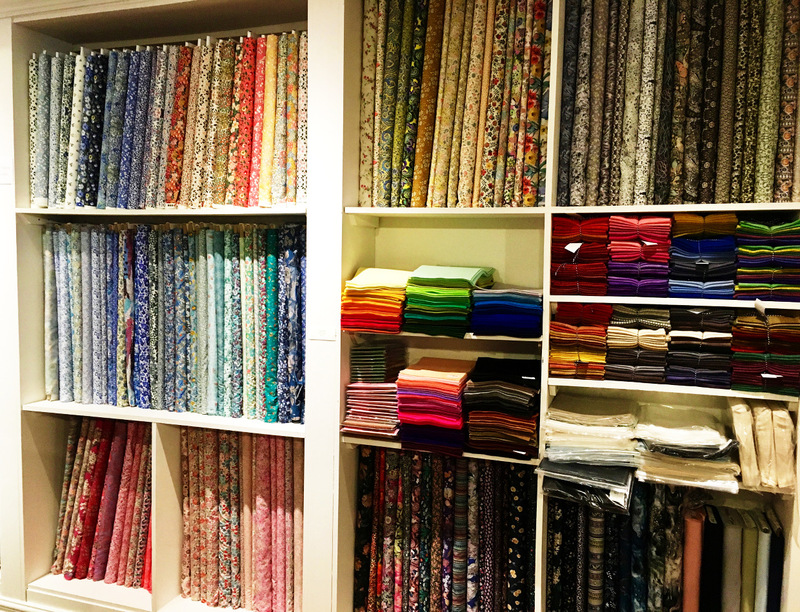 They stock over 250 Kona solids and plenty of rotating new collections to provide inspiration. I mean, who could resist these little faces? They also carry some lovely quilting accessories and notions that you just won’t see in person many places anymore, so I enjoyed spending some time here, checking everything out. 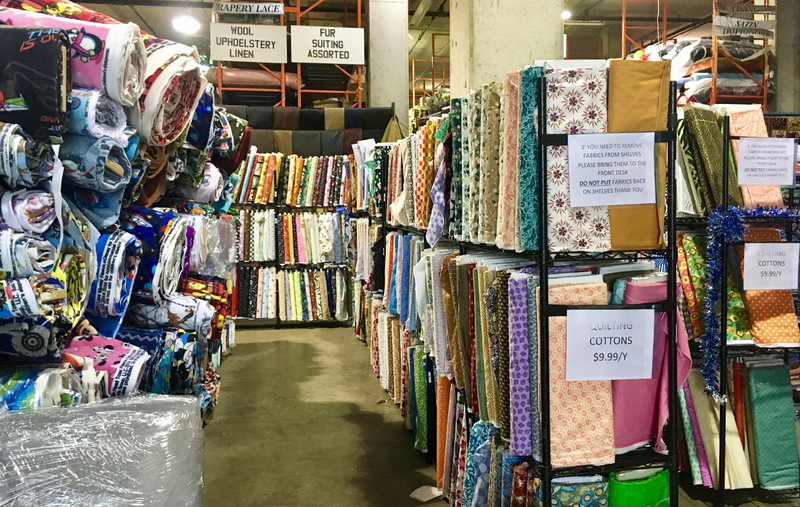 A large discounted fabric corner full of quilting cotton is another good reason to pay them a visit. My last stop was Fabric Fabric, in the Stockyards district. To be honest, I have always avoided this place even though it is very close to where I live. 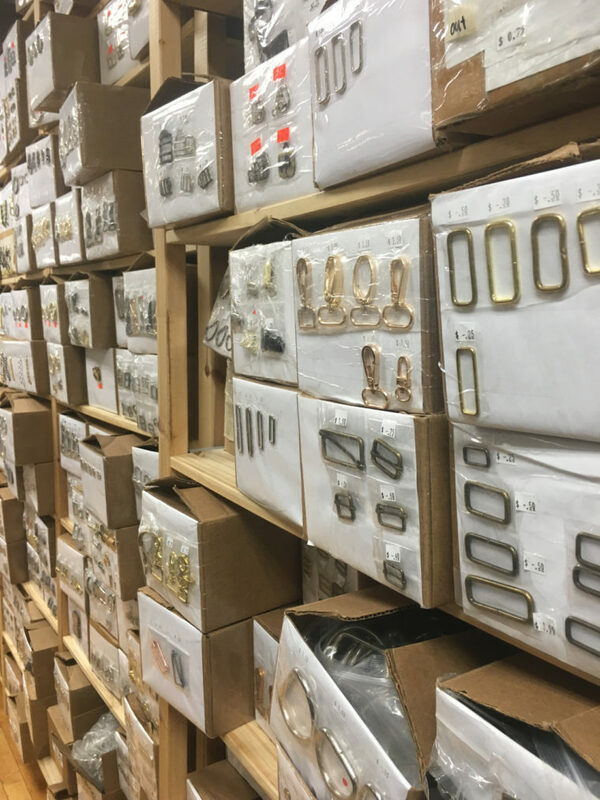 It is unapologetically a warehouse shopping experience, but I was pleasantly surprised to find that the staff here know their stock very well. 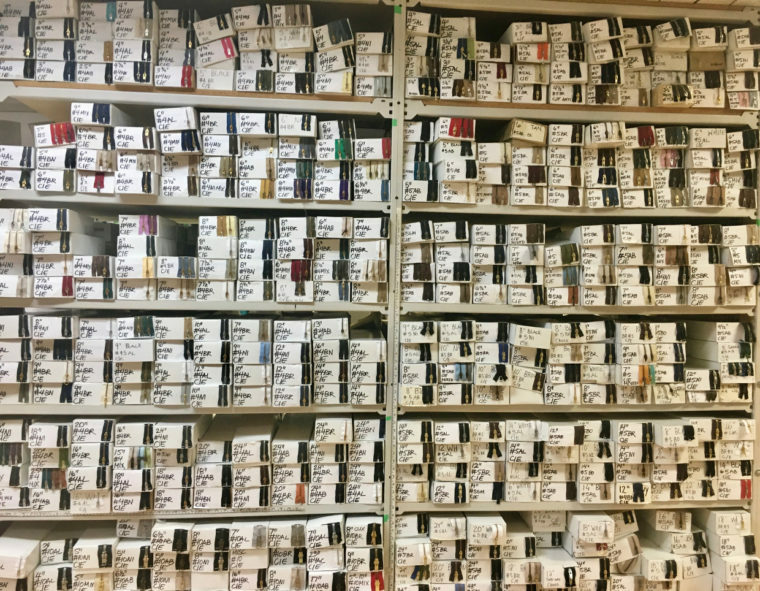 If you were looking for a specific type of garment or home dec fabric, or willing to take a chance on finding something at a deep discount, it might be worth your while, if you can manage the warehouse experience without the benefit of swatches. As I mentioned at the start, Toronto has a strong history of garment making and fashion, so there are many more shops than the ones I mentioned here! 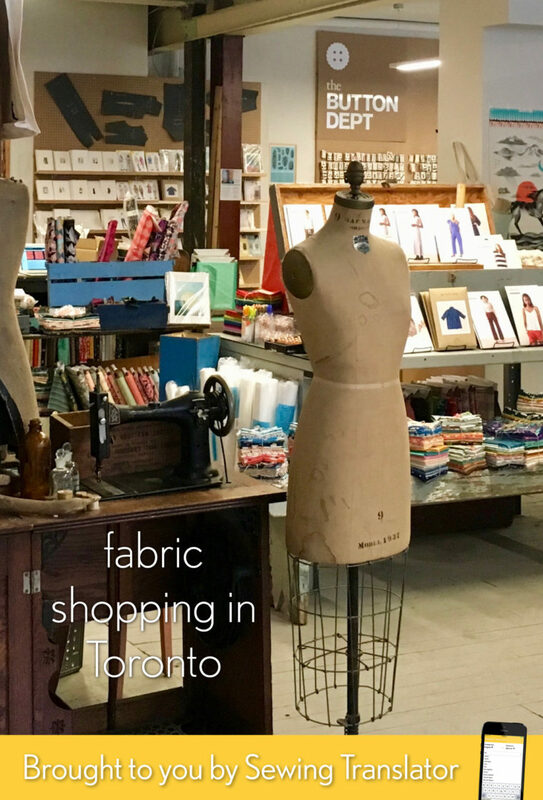 You will find Fabricland stores on the fringes of the city, and smaller shops like King Textiles and Fabric by Designers on Queen West, as well as MacFab on the East side of town. In short, there’s something for everyone here. You should never be bored. Happy shopping! I love these city-by-city posts! I’ve already used the tips from your story on Nashville and hope to use others in future travels. And…even if I don’t, they are still fun! I’m glad you enjoy them. Thanks for commenting! Three cheers for Toronto! I’m on the east end, but I rarely hesitate to jump over to the west end to shop for fabric, especially at Designer Fabrics. I was devastated when I showed up one day and saw the signs that they were closing, although I did go home that day with armloads of stash at their “50% everything in stock, no exceptions” clearance. 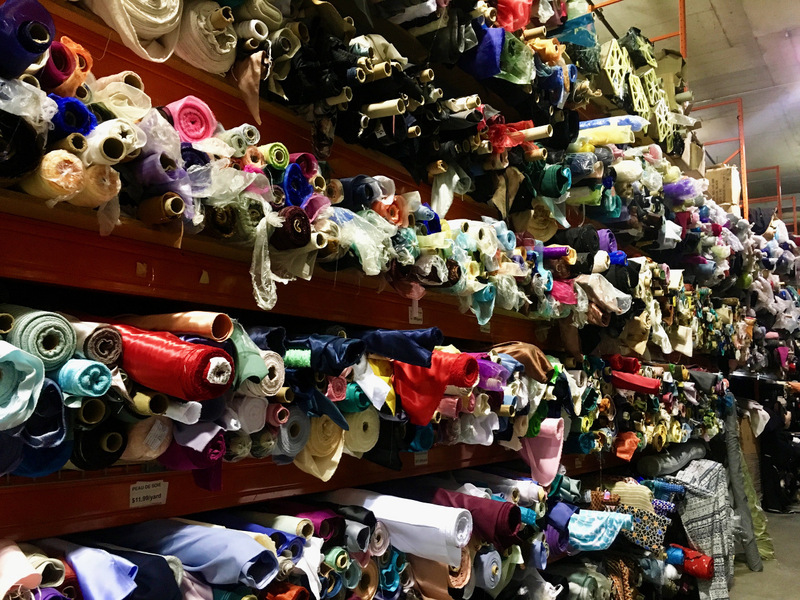 Thank you for sharing with us that we can now find their supplies of silks, shirting, and much more at Len’s Mill. I was wondering where all of it went! Thanks for writing this post, Jessica. I’m so glad this is helpful! And sorry to hear about the loss of your shop. It’s always sad when that happens. You’re welcome Erica! I’m glad you enjoyed the post! I too have been thoroughly enjoying this series on fabric/sewing shopping in cities around the world. 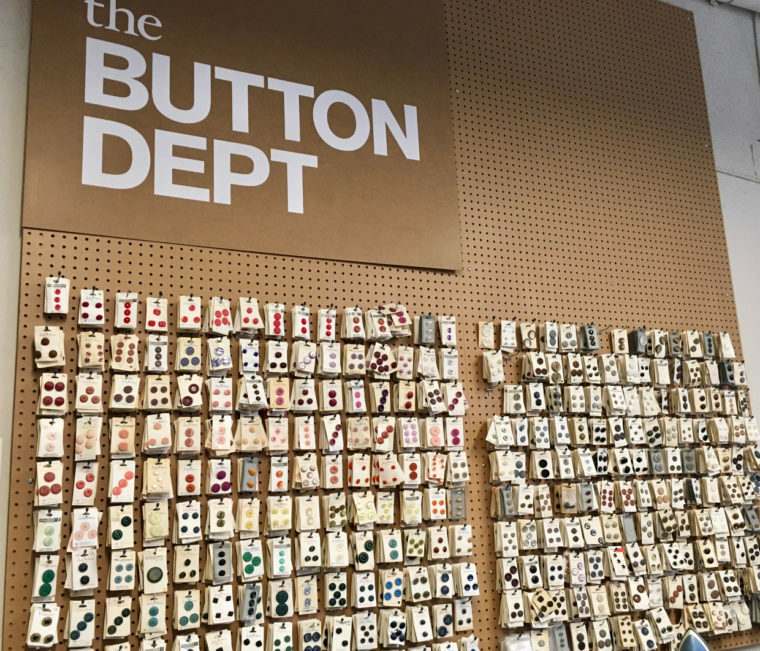 Such a great list of places sure to make another maker heart’s sing… a creative way to see bits of a city based upon its making his/herstory as well, as this author in this post has done brilliantly. Toronto is my “home town” meaning it’s the place of my birth but I haven’t actually lived in the city for more than thirty years. Long before I returned to sewing. It was fun for me to read all these spots which I know well in terms of location in the city. I lived up the street from a few of the ones mentioned in 1977 which I’m sure look much different today. I wasn’t looking for fabric or sewing supplies really until I moved to Victoria BC in 2013. So thank you to this author for this lovely walk down memory lane for me 🙂 I would trust her recommendations 100%! Aw, that’s great! Thanks for commenting. This is so timely! I’m just about to leave for a very quick trip to Toronto (from Singapore) and was just wondering how to use my free time. Now I know…thank you!! And we’ll conveniently be staying near High Park, so this is even better. Eloquently written Jessica, and thank you for your intimate knowledge of the city and smaller ‘burrows’. The images paint a picture of a day spent in ‘creative mode’, developing the next project in mind! Not a city person this post makes me think even I could appreciate a get away to the big smoke to bring back some lovelies. Thanks for sharing! You didn’t mention Fabric Spark and Country Clothesline. Two stores, two different aesthetics, one great location in Toronto’s east end. 471 Cosburn Avenue… great selection, great classes, and super friendly. Highly recommended! Thanks for posting!! I live an hour from TO, and there were a couple of places on here that were new to me! Time for a trip!